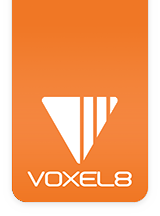 Below are some 3rd party Software Tools that you can leverage in the design, development and printing processes with your Voxel8 Developer's Kit. Feel free to explore beyond these with your Developer's Kit projects, and feel free to provide us additional feedback on your experiences. Rhino - organic 3D modeler. FreeCAD - an open-source parametric 3D CAD modeler. Autodesk Inventor - nice CAD package from Autodesk. Blender - open source mesh modeler. OpenSCAD - pro grammatical 3D modeler. SolidWorks - with the Voxel8 add-in you can leverage this workflow to create 3D printed electronics. Autodesk Project Wire - using this workflow, you can build 3D printed electronics on the Voxel8 machine. MeshLab - useful for viewing and basic modifications fo .STL's after generation. MeshMixer - a mesh modifier and viewer for .STL files. If you have questions about how we use some of these tools internally, then please contact us.